We’d love your help. Let us know what’s wrong with this preview of The Bigfoot Files by Lindsay Eagar. The Loch Ness Monster. The Frogman. Bigfoot. Twelve-year-old Miranda Cho used to believe in it all, used to love poring over every strange footprint, every stray hair, everything that proved that the world was full From the author of Hour of the Bees comes another captivating story that deftly blurs the line between reality and magic -- and will leave you wondering What if? To ask other readers questions about The Bigfoot Files, please sign up. So, if you know me at all, you know I have to read allllllllllllllllllllllllllllll the YA and MG Bigfoot books. If I even see the hint of the big furry creature, this girl is 245% in. So, when I found a book that not only features my love AND other magical, crytozoological creatures? This girl had to put a lid on herself because she was about to spill over with the feels. However, I didn't quite expect what I fully got with this book. Like, this was dark, emotional Bigfoot???? Like Bigfoot was Bigfoot but he was also a symbol of some dark, emotional things that were going on with Miranda's family situation. Like, I only thought I would be crying because I had too many Bigfoot feels, but I was crying because things were really sad and tense and panicky at parts??? Also this is magic realism that doesn't pop up until halfway in the book? They were changes that I didn't see coming with my innocent Bigfoot loving eyes, but it actually really really worked for this? There was a lot going on in this little book, but it was all very intriguing and I was in deep with it. We're introduced to our 12 year old heroine, Miranda, who is class president, academically smart and all about making a plan and getting it down. Basically, a kid after my own heart because lists are epic. Miranda is crushed, though, by the embarrassment that her mom brings by the Critter Mobile loads, her quest for perfection, and how she deeply desires to have a friend who isn't scared off by her mom. When she finds a hidden drawer of stacked up bills with final notices, her panic goes in overdrive, and she sets up a plan to show her mom that if Miranda can't find Bigfoot, all hope is lost and it's time for Mom to give up the Bigfoot and grow up. The characters were brilliant. I loved Miranda and Kat, her mother. I could easily see where both of them were coming from. I could see the desire to believe in the unexplained and do what makes you passionate, but also, I'm far more like Miranda where I see you have to go with your head instead of your heart. Miranda easily felt like the parent in the relationship, and my heart was so sad for all the stress on her. Yes, this book makes you feel so deeply with each of the characters that I literally am talking about these people like they're real and LIKE, WHAT IS THIS. WASN'T I JUST HERE FOR THE BIGFOOT? They also had such an interesting and realistic dynamic, and it was beautiful and heartbreaking to see the struggle and journey they had to go on. The writing was quite good as well. This book read like a cross between a YA book and a middle grade book. As I said, it got really emotional and kind of dark in parts that I sometimes was like, wow, I would have not appreciated this fully as a kid. I definitely think YA readers would like this to cross over into the genre or if MG readers are looking to start reading YA books. But Eagar definitely knew how to create a flow and feelings and had some great pacing since I was never bored. The setting was amazing, too. Like, the descriptions were just AMAZING. I totally felt that I was in the forest that Kat and Miranda were in. I could feel the mist and the humidity and just I loved being in the woods in this book. It was brilliant, and I was just so immersed. I also love the fact that I could never really tell where we were going with the book. I mean, it takes us about halfway to get to the real action of the story. I never really figured out if we were just here for the Bigfoot fun or if there was like some big twist - and trust me, there is a twist of sorts and we switch genres and it actually was really really cool. This is a genre that I can get behind and it felt very organic to the story, which could have been really jarring had Eagar not flowed it so seamlessly. Also, there was a great amount of Bigfoot action, and I was all for it. I love when a book unexpectedly surprises you and you discover an author you've never read before and knew little about, but find that you give yourself over to their writing with such trust because they are wonderful at weaving their tale. One does not see the cover and title of a book The Bigfoot Files and think: Mother-daughter relationships. As a boy, like many kids, I was fascinated by all manner of legendary creatures: Loch Ness monster, Bigfoot, the Lizard Man (a South Carolina creature th I love when a book unexpectedly surprises you and you discover an author you've never read before and knew little about, but find that you give yourself over to their writing with such trust because they are wonderful at weaving their tale. One does not see the cover and title of a book The Bigfoot Files and think: Mother-daughter relationships. As a boy, like many kids, I was fascinated by all manner of legendary creatures: Loch Ness monster, Bigfoot, the Lizard Man (a South Carolina creature that I learned about at summer camp and cost me many sleepless nights that week I was there). My friends and I spent every moment that wasn't an activity required of us by the camp, searching for clues and any trace of the Lizard Man, but to no avail. My friends and I could find no proof that this Lizard Man even existed in anything but our overactive imaginations and tales told by campfires at night. Now, over forty years later, I look back on that time with nostalgia and fondness. It is with such memories that I come to Lindsay Eagar's wondrous novel The Bigfoot Files. What would my life be like if I, as an adult, still searched for the Lizard Man? What would the life of my kids be like if I was obsessed with such a pursuit? Well, Miranda Cho's mother does. Her mother, Kat, a cryptozoologist, goes on sudden, spur-of-the-moment trips to remote wilderness locations in search of the elusive Bigfoot and drags her daughter with her. Her mother runs a blog - The Bigfoot Files. "She and her mother had been hunting for years. She was ready to know . . . What if this is it? What if I turn the corner, around this pine, down this gulley, and I see him? What if we found Bigfoot?" The oak leaves turned over, a soft breeze finding them above Miranda's head. And beside her, something rustled the well-manicured hedges trimmed along the junior high building. Her pulse spiked and her breathing slowed, her back straightening against the trunk, All involuntary reactions, her body triggered by the sound of twigs snapping and the smell of fresh air. It's nothing, she told herself. A squirrel or a bird. Her mind knew there were no such things as monsters, but her body was slower to convince. When a pigeon hopped between bushes, she still exhaled harder than was necessary. We see the struggle of a twelve-year-old girl who is having to be the adult to her own mother. A girl who is so stressed that she pulls out strands of her own hair. A girl who only wants to go to a leadership conference in Washington, DC but is in fear of losing even that dream because of all the days she's missed in school because of her mother's crazy trips to find Bigfoot. So what happens when Miranda agrees to go on one last Bigfoot trip with the goal of simply proving her mother wrong once and for all? But we, the readers, watch and begin to question ourselves if magic is really real? Lindsay Eagar's book is captivating and emotional. The relationship and the strain that comes from the tensions between mother and daughter as well as a child growing up really underpin this story. Eagar has a way of allowing the reader to see and feel what her characters are. She writes gorgeous prose that is poetic and yet is absolutely necessary for portraying the thoughts, feelings, and actions of Miranda. This is a glorious work of fiction. Ok, I will admit it, I am fascinated by Bigfoot. Sea monsters, the Loch Ness monster, and all those other mythical creatures draw my attention because their identity is baffling. Do you believe it or do you not? Are those individuals who seek after them weird or are they unlucky? When I saw the title and the synopsis for this novel, I had to read it! Miranda’s mother studies cryptozoology. Her mother investigates and organizes the hunts for legendary creatures, in the hopes of proving their exis Ok, I will admit it, I am fascinated by Bigfoot. Sea monsters, the Loch Ness monster, and all those other mythical creatures draw my attention because their identity is baffling. Do you believe it or do you not? Are those individuals who seek after them weird or are they unlucky? When I saw the title and the synopsis for this novel, I had to read it! Miranda’s mother studies cryptozoology. Her mother investigates and organizes the hunts for legendary creatures, in the hopes of proving their existence. Charting the different sightings, she also manages a blog, and drives the most unique vehicle that you wouldn’t want to be seen in. This wouldn’t be such an issue except with no other relatives to fall back on, Miranda’s had no other choice but to tag along with her mother all these years. Now that she’s twelve, Miranda is tired of playing along. She feels it’s all a big waste of time and she just wants a normal mom. It’s time to show her that “her big break” is not coming. Meet Miranda, the overachiever. Miranda strives to be perfect, issue #1. Issue #2, Miranda stretches herself too thin by trying to do too much. Issue #3 Miranda overthinks – she over analyzes situations for which she has no control. When you put these all together with a mother who is trying to “find her big break,” it’s a recipe for disaster. I really did like the character of Miranda because of the issues that she was dealing with. She thought she hid her frustration and anger but little-by-little, she was coming undone. There were times that I thought Miranda was going to lose control but somehow, she kept it together. I didn’t know what to think about the mom. She was a different and frustrating character to me. I thought she was flaky but then, when she needed to be a parent, she came through. Definitely an interesting read. THE BIGFOOT FILES is the story of Miranda, a hyper-practical girl dealing with her cryptozoologist mother. But there are so many threads to this book, including absent fathers, obsessive compulsive tendencies, friendship fallouts, money worries, school pressures...yet it manages to combat these AND keep a beautifully magical tone. The scenes in the Fable Forest were my favourite. The imagery Eagar uses is so vivid and ethereal, and the bonding between Miranda and Kat was ten I am FEELING THINGS!! The scenes in the Fable Forest were my favourite. The imagery Eagar uses is so vivid and ethereal, and the bonding between Miranda and Kat was tenderly wrought. There was danger, monsters (or WERE they monsters? ), and a fantastical combination of real-world and outlandish tensions. If I had one complaint, it was that the dynamic between Kat and Miranda felt a bit monotonous after a while, with the kooky/sensible dynamic being enforced again and again. But overall, I ADORED this book, the magic and the heart, and I'll be recommending it to MG fans of all genres! Disclaimer: I received this book for free from LibraryThing Early Reviewers in exchange for an honest review. This does not affect my opinion of the book or the content of my review. I got this book via NetGalley. This was a unique middle-grade, to say the least. I had never read a book about Bigfoot before, even though I used to be really into cryptozoology. But this is more than a book about Bigfoot. The mother-daughter relationship was complicated and somehow really relatable. My mom doesn't chase after cyptids, nor have a car with the face of Bigfoot like a Cars (the movie) phenomenon. But it felt close. Miranda's mom's only job is being a freelancer cryptid blog writer, a I got this book via NetGalley. The mother-daughter relationship was complicated and somehow really relatable. My mom doesn't chase after cyptids, nor have a car with the face of Bigfoot like a Cars (the movie) phenomenon. But it felt close. Miranda's mom's only job is being a freelancer cryptid blog writer, and for that she needs to travel a lot to look for cryptids. Which aren't a regular thing, mind you, since this is kind of contemporary. Miranda is made to go with her, missing school and losing friends and having to fight within herself with the urge to say to her mother that cryptids aren't real, there's no Bigfoot, please let's just go home I don't want to be in this muddy forest for the next four days for nothing. First, I'd never choose a seventh grader for student council. This is a recurring thing in the contemporaries I've read recently for some reason and I just can't believe it. Mother and daughter go on this trip to a forest where Bigfoot has been spotted (as if), and they get lost because of a bear chasing them. The book was okay up to that point, and then everything went downhill for me. In this forest, they begin to see things. The bear that chased them was particularly intelligent and didn't quite behave like a bear. They use a giant fish as a boat. They see a weird bug that eats tree cores, which Miranda says she's never heard of before, and she's made really extensive research to go on this trip with her mom. And then she sees fairies and dances with them and they change the color of her hair. But still she chooses not to believe in these creatures, firmly and annoyingly. Every second line is her saying fairies, big fishes and core eating bugs don't exist. She's in a constant bad mood even after these events take place because she can't believe her mother believes in these things that don't exist (even though she had been JUST dancing with fairies). And it's really, really annoying. I couldn't stand her for the second half of the book because of this. And then they see Bigfoot, and they enter its cave, and Miranda is still in the brink of not believing and I swear to god I was so TIRED of her. Because of how much strength she puts on not believing, on making her mother look ridiculous, on screaming and throwing tantrums because these things aren't real. Not because she wants to go back home, or because they're lost, or because she's hungry. Just because her mother believes in these things (that now are palpable) and she doesn't. It drove me mad. Mirando Cho is tired of being the parent. The 12-year-old student council president is dead set on securing a spot in a leadership camp this summer that will get her out of the house and away from her cryptozoolist mom, Kat. Kat's obsession with mythical monsters, especially the ever-elusive Bigfoot, has taken center stage in her life: bills have gone unpaid, the house is in danger of foreclosure, and neither her father nor her grandmother is interested in helping out. It's time for Kat to grow Mirando Cho is tired of being the parent. The 12-year-old student council president is dead set on securing a spot in a leadership camp this summer that will get her out of the house and away from her cryptozoolist mom, Kat. Kat's obsession with mythical monsters, especially the ever-elusive Bigfoot, has taken center stage in her life: bills have gone unpaid, the house is in danger of foreclosure, and neither her father nor her grandmother is interested in helping out. It's time for Kat to grow up, and Miranda has a plan to make it happen. The two set off together for another Bigfoot hunt, where Miranda plans to confront her mother with everything; once she breaks her down, she'll help her get back on track to being a responsible adult. But nature has a different plan, and Kat and Miranda end up lost in the woods together. Miranda may have a thing or two to learn about magic after all. The Bigfoot Files is an interesting take on the "irresponsible single parent, stressed out smart kid" story. We've got a mom who still has that spark of magic in her, but she's let it take over her life, to the detriment of her daughter and the family finances. She's always ready for the big score: the picture of Bigfoot, the big research grant, the one moment where the proof will magically appear. Miranda has overcompensated for her mother's flightiness by becoming an overachiever with compulsive tendencies - she pulls her hair out to soothe herself and obsessively focuses on her planning, research, and lists, lists, lists. Kat is frustrating, and Miranda isn't always sympathetic, which - let's be real - is spot on. Both parties need to give a little to get somewhere, hence the trip into the woods. And that's where things get interesting. Miranda is the ultimate skeptic - and as readers, so are we - until a pivotal moment that threatens to turn everything upside down. We get a touch of the speculative in our realistic fiction, inviting readers to keep the faith; there is magic to be found out there, if you're willing to find it. Ultimately, readers and our characters come to a compromise and understand that somewhere in the middle lies the best way to go: bills still need to be paid, and magic can still exist. I received a free advanced copy of this book from the LibraryThing Early Reviewers giveaway in exchange for an honest review. Miranda Cho is an overachieving teen who is extremely embarrassed by her mother Kat’s career as a cryptozoologist. Don’t know what a cryptozoologist is? They are people who search for the existence of mythical creatures...AKA Bigfoot hunters. Told from Miranda’s point of view, we learn that she is super organized, lives by her lists, is student council president and worki I received a free advanced copy of this book from the LibraryThing Early Reviewers giveaway in exchange for an honest review. Miranda Cho is an overachieving teen who is extremely embarrassed by her mother Kat’s career as a cryptozoologist. Don’t know what a cryptozoologist is? They are people who search for the existence of mythical creatures...AKA Bigfoot hunters. Told from Miranda’s point of view, we learn that she is super organized, lives by her lists, is student council president and working to attend a leadership camp in DC, all so she can eventually “escape” her mother. One day Miranda comes across a pile of unopened bills in a drawer and realizes her mother hasn’t been paying the mortgage so they are close to losing their home. Miranda decides she’s going to be the responsible one and solve all her mom’s problems by getting her to go on one more failed Bigfoot hunting trip to finally realize Bigfoot isn’t real. Miranda also plans to confront her mother about the unpaid bills and convince her to get a “real” job. But nothing goes as planned, because on the trip Miranda and her mother get lost in the woods and what happens during their journey home is a magical story of a mother and daughter finding an understanding of each other. Thanks to Candlewick, I've read this latest book by Lindsay Eagar, out in October. I have previously loved Lindsay's Hour of The Bees, then Race To The Bottom of The Sea, all three realistic family stories of girls struggling to overcome personal (inside family) challenges, brushed with the magic of both believers and non-believers. 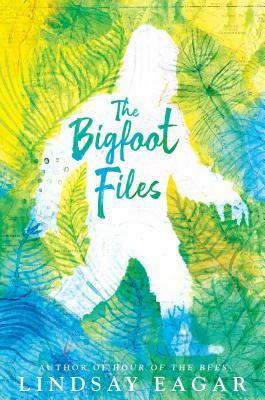 In The Bigfoot Files, there happens to be a television show that follows and documents those thought-to-be-crazed searchers and believers of beings in our world lik Thanks to Candlewick, I've read this latest book by Lindsay Eagar, out in October. I have previously loved Lindsay's Hour of The Bees, then Race To The Bottom of The Sea, all three realistic family stories of girls struggling to overcome personal (inside family) challenges, brushed with the magic of both believers and non-believers. In The Bigfoot Files, there happens to be a television show that follows and documents those thought-to-be-crazed searchers and believers of beings in our world like the Loch Ness Monster, or Bigfoot! Twelve-year-old Miranda Cho had always believed it all, believed her mother's obsession with monsters, her life filled with talk of sightings, overnight camping trips with others using night vision to capture a first look, and stories from her mother she asked for with the words "Tell Me A Monster." At twelve, a skeptical, want-to-prove-it Miranda has emerged, especially when her quirky mother, Kat, embarrasses her before a friend, now lost, and hides unopened bills and notices of foreclosure in a silverware drawer. Her eyerolls and words of disgust say it all. She wants proof like every scientist. Miranda agrees to go on one last creature hunt and plans to prove once and for all that her mother is wrong, wrong, wrong. It's time to grow up and be a real mother. What if? Miranda has always been surrounded by cryptozoology -the study and belief of Bigfoot, Fairies, Werewolves and all manner of other creatures. Her house is full of her mum's (Kat) collection of hairs, footprint casts, fairy figurines and photos. Miranda would share her mum's excitement on their trips around the country, following recent sightings and clues, but lately something's changed. What if it's all fantasy? Their van, 'the Critter Mobile', is plastered with Kat's website 'The Bigfoot What if? Miranda has always been surrounded by cryptozoology -the study and belief of Bigfoot, Fairies, Werewolves and all manner of other creatures. Her house is full of her mum's (Kat) collection of hairs, footprint casts, fairy figurines and photos. Their van, 'the Critter Mobile', is plastered with Kat's website 'The Bigfoot Files' which consumes all Kat's time and embarrasses Miranda immensely. Kat's obsession has lost Miranda a best friend, and the unorganised, haphazard way they live has moulded Miranda to be the complete opposite of her mum. Miranda is a list maker, a high-achiever and student president of her school. The stress of this causes her to pull her hair out - literally. The last straw for Miranda is a pile of un-opened bills, and her frustration and anger helps her plot a plan to make Kat see the truth of her obsession, once and for all. Being a fan of Cryptozoology and Lindsay Eager, I had to read this book. Miranda is a likeable character, and her own obsession of order, productivity and achievement is very real. She feels she is the adult in the household and even though she was raised on the magical, unseen things in life, she has had to grow up too fast. Her constant 'what if's' are a result of wavering belief in her mother's dreams and also from real fears while growing up - school, friends, and her future. As children grow and understand more of the world around them, they can begin to question their parents and everything they've been told. This story tackles that uncertainty wonderfully. This review and many more are available on Read Till Dawn . I mean, I don't believe in the Loch Ness Monster or the Frogman or Bigfoot or any other fantastic creature for that matter. I like books that play with their existence, or that work them into the plot, but I don't believe they're real. Miranda's mother does, and she's gone really nuts about proving that they are. And that's great and all, and the book is a nice story about mother-daughter bonding, but at the same time I sti This review and many more are available on Read Till Dawn . Miranda's mother does, and she's gone really nuts about proving that they are. And that's great and all, and the book is a nice story about mother-daughter bonding, but at the same time I still don't really agree with the mother at all. Like, just because something exists doesn't mean you need to prove it's real (especially when it's clearly trying so hard to stay hidden). And you definitely should not be dragging your young daughter around to do it, continually disrupting her education and messing with her plans and making her panic your failing finances just because you need to go on yet another search for a crazy creature. But somehow they both think that if these creatures are real, what Miranda's mother has done make sense. It doesn't. I couldn't really get over that. I also thought that Miranda's attempts at using the scientific method were kind of spotty, and I actually really related to her love for list-making but even I thought her approach to planning everything down to the nano-detail was a bit much. It was an interesting enough read, but for my tastes it was a little too zany to be a good realistic novel and a little too realistic to be a fun zany novel. By all means do give it a go if you're curious about it, though. Lindsay Eagar has a way with words. A way of making you feel and see what is happening in and around her characters. It feels magical to me, and I can appreciate what she is doing. This style of writing, explaining things in multiple ways, some literal, many figurative, can bog down a reader not wanting to get lost in the writing. I'd hand this story to a reader that isn't in a rush, one that wants to wander alongside Miranda, finding out who she is and what makes her so, in her own good time. Wh Lindsay Eagar has a way with words. A way of making you feel and see what is happening in and around her characters. It feels magical to me, and I can appreciate what she is doing. This style of writing, explaining things in multiple ways, some literal, many figurative, can bog down a reader not wanting to get lost in the writing. I'd hand this story to a reader that isn't in a rush, one that wants to wander alongside Miranda, finding out who she is and what makes her so, in her own good time. When we meet twelve-year-old Miranda Cho she is fed up with her mother's obsession and job as a cryptozoologist. Miranda is bitter and resentful. She is also a perfectionist that is trying desperately to control what she can in her own life. But what she doesn't see is that she is searching, believing, in something as elusive as her mother's Bigfoot. Miranda is searching for a connection with her father, the man that walked out of her life when she was five-years-old. This story is one of understanding what motivates people, what can catch them up and fascinate them, and a story of finding. Finding answers, finding questions, and finding out what makes us who we are, which can take the hardest searching of all. If you believe in fairies–clap your hands! If you believe in bigfoot–stomp your feet! We all want to believe in magical creatures, mysterious monsters and lore, like bigfoot. So when I saw this book on the for new publications, I had to have it! This author has an incredible talent in weaving a tale, drawing in the reader, and making it all seem possible just by using words. You will want to believe by the time you’re done reading. In this story, there’s a twelve year old girl who must be the parent since her mother is lost in fantasy land. Craving a normal life from the one her mother provides, she is determined to show her mother that bigfoot does not exist. However, this trip turns out to be more than what she bargained for. This is the story of Miranda, her faltering relationship with her mother, a young girl dealing with adult problems, a mother who isn’t being a parent to her, all the while trying to hang onto her own childhood. Are you a believer? When you’re flipping through channels on your TV, do you stop when you find mention of Chupacabra, Nessie, or the granddaddy of them all, Bigfoot? Do you yearn to be a Cryptozoologist? If you answered yes to any of these questions, or even if you just like a good story with a sense of wonder, then I strongly suggest that you read The Bigfoot Files by Lindsay Eagar, which comes out October 9, 2018, from Candlewick Press. It’s the story of twelve-year-old Miranda, a smart girl, Are you a believer? When you’re flipping through channels on your TV, do you stop when you find mention of Chupacabra, Nessie, or the granddaddy of them all, Bigfoot? Do you yearn to be a Cryptozoologist? If you answered yes to any of these questions, or even if you just like a good story with a sense of wonder, then I strongly suggest that you read The Bigfoot Files by Lindsay Eagar, which comes out October 9, 2018, from Candlewick Press. It’s the story of twelve-year-old Miranda, a smart girl, student body president, and on the verge of winning a summer in Washington, D.C., a chance to get away from her Bigfoot hunting mother. When she was young, Miranda believed her mother’s stories, and had an affinity for fairies, but now that she’s older, lost a friend, and found out her mother is on the verge of financial ruin, everything changes. When her mother announces her newest venture to find Bigfoot, Miranda decides to take matters into her own hands. Miranda has had an unusual childhood. Her mother, Kat, is a cryptozoologist. They have traveled all over looking for monsters like Bigfoot. Now, Miranda has grown into a highly organized, highly tense pre-teen. She struggles for perfection, hoping that nobody will notice her very unconventional home life. I mostly enjoyed this story of how we judge unfairly, even the people closest to us, and how sometimes the thing we are looking for is right in front of us, if we will only choose to see it. I Miranda has had an unusual childhood. Her mother, Kat, is a cryptozoologist. They have traveled all over looking for monsters like Bigfoot. Now, Miranda has grown into a highly organized, highly tense pre-teen. She struggles for perfection, hoping that nobody will notice her very unconventional home life. Being on a YA kick and also loving Bigfoot, I knew I had to buy this as soon as I saw it. Fortunately, it was everything I hoped for. It's a story about growing up too fast, rebelling by being responsible, and learning to trust your own imagination. Kat and Miranda are such good characters, and the author does such a good job at turning Kat from the antagonist to the hero through the book. If you're a daughter without a father, this one will especially stick with you. Added bonus: I can now add " Being on a YA kick and also loving Bigfoot, I knew I had to buy this as soon as I saw it. Fortunately, it was everything I hoped for. It's a story about growing up too fast, rebelling by being responsible, and learning to trust your own imagination. Kat and Miranda are such good characters, and the author does such a good job at turning Kat from the antagonist to the hero through the book. If you're a daughter without a father, this one will especially stick with you. Miranda is determined to shift her family’s trajectory after finding past-due and foreclosure notices addressed to her starry-eyed, Bigfoot-chasing mother Kat. Organized and science-minded, Miranda is her mother’s opposite, but even her best-laid plans to turn her mother away from Bigfoot and toward a respectable career collapse when the pair ends up in a national park with no cell phones, no vehicle, and danger at every turn, and Miranda starts having experiences that defy the science and logic Miranda is determined to shift her family’s trajectory after finding past-due and foreclosure notices addressed to her starry-eyed, Bigfoot-chasing mother Kat. Organized and science-minded, Miranda is her mother’s opposite, but even her best-laid plans to turn her mother away from Bigfoot and toward a respectable career collapse when the pair ends up in a national park with no cell phones, no vehicle, and danger at every turn, and Miranda starts having experiences that defy the science and logic that have always grounded her. Who knew a story about Bigfoot would feature such a heart warming and charming Mother/Daughter story line? It’s certainly not what I expected. I really appreciated featuring Miranda with her Anxiety and Trichotillomania. It’s refreshing to see in a story. Nothing shameful, just her way of coping with stress. The book doesn’t really read like an MG book. I’d say it’s maybe younger YA? All around, The Bigfoot Files is a pleasant surprise of a book. a sweet story about a daughter coming to terms with a not so perfect, yet actually perfect life. I'll be honest, wasn't sure I would get to this ARC (received at SDCC) when I found out it was about Bigfoot. I am not a fan myself, but the book was so much more and primarily focused on the relationship between a daughter and her mother. The story was enjoyable and I liked the twists and turns the novel contained. I adore this quirky little book. As soon as I knew what the concept was, I was sold on it, but Lindsay managed to surpass my expectations and really give me something deeper than folklore to think about. This book provides great lessons in love and acceptance, and I can't wait to share it with the little people in my life. What a beautiful book about mothers, daughters, and magic! Lindsay Eagar writes so vividly -- I felt I could touch the bark of the trees, smell the autumn air -- and I fell completely in love with both Miranda and her mother, Kat. I don't want to say too much about the plot for fear of giving things away, but it left me breathless and heartbroken in places. Simply stunning. I quickly fell in love with the mother - daughter dynamic in this book. There is so much of being twelve that resonated with my former twelve year old self. But both characters keep moving, neither is stagnant in their roles, and the dance they play in the forest is beautiful and fun. I loved all the cryptozoology wrapped up in the book, it was a fun package in which to deliver this mother daughter story. I need another dozen books about the adventures of Kat Cho and all the different creatures she discovers. I absolutely loved this book. I love the suspense, mystery, creatures, and adventure. I also love the emotions, the bond between mother and daughter.